The Printing industry is characterized by a medium level of globalization. Industry imports and exports account for less than 10.0% in terms of revenue. The majority of printing companies operate on a local or regional basis, customers being within a 100 to 300 radius of facilities in order to limit transportation costs and delivery time. However, there are some leading companies in the US industry that include international operations. One of them is R.R. Donnelley, which has operations throughout Asia, Europe, Latin America and Canada and Quad/Graphics, the second-largest company in the industry, has facilities in Europe and Latin America. The rise of digital printing and a decreasing in domestic demand, will result in industry globalization which is expected to increase over the next five years because industry operators look abroad for new markets. The world’s largest full-service provider of print and related services is R.R. 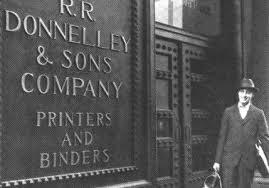 Donnelley & Sons Company, founded more than 140 years ago. The company covers a wide variety of private and public sectors having more than 60,000 customers. Headquartered in Chicago, it employs has about 58,000 people. Although R.R. Donnelley has printing operations outside the Us borders, it generates about 76.1% of its revenue in the United States. The company has its headquarters in Wisconsin and founded in 1971. Quad/Graphics Inc. was the world’s largest privately owned printer of magazines, books, catalogs and direct mail before being listed on the New York Stock Exchange in 2010. In July 2010, Quad/Graphics Inc. completed its acquisition of World Color Press Inc., which was the second-largest print provider and related services in the Americas before acquisition. Now it is the second-largest commercial printer in the United States. 87.8% of total company revenue is represented by the US revenue and currently has 24,300 employees. 3. World Color Press Inc.
World Color Press Inc. (formerly Quebecor World Inc.) was one of the largest commercial printers in the world, before its acquisition. It has 87 printing plants and other related facilities globally. The company operated in the commercial print media segment in North America and Latin America. In early 2008, Quebecor World Inc. filed for creditor protection in Canada and the United States as a result of industry pressures, particularly in Europe. Another reason for that was also the inability to raise new capital or complete the sale of its European operations. With its headquarters at Shoreview, MN, its main sector of activity relates to small businesses and financial institutions. It provides personalized printed items (e.g. checks, forms, greeting cards, business cards, stationery, labels and retail packaging supplies), merchandising materials and promotional products, financial institution customer retention programs and fraud prevention services. 94.1% of its revenue is derived from the US market. Based in Baltimore, Vertis Communications is a privately held company with production and sales offices throughout the United States. It serves local, regional, national and international companies encompassing diverse industries. Products and services include: digital media production, consumer and media research, media planning and placement, creative services, advertising insert programs, circulation-building newspaper products, fully integrated direct marketing programs and e-marketing. Consolidated Graphics Inc. is a commercial printer primarily using offset lithography to produce images on paper located in Houston. Among the sheet-fed and half-web commercial printing companies, is one of the nation’s largest. The company operates in 27 states, having 70 print businesses, one Canadian province and the Czech Republic. Consolidated Graphics serves over 20,000 customers and has 5,487 employees. The commercial printing services consist of traditional printing services, which include electronic prepress, printing, finishing storage and delivery of printed documents; fulfillment and mailing services; and e-commerce. Cenveo Inc. is the leading printer of envelopes in the United States and Canada. Also is a leading general commercial printer in several major US markets. The company is the successor of Mail-Well Inc. that was reincorporated as Cenveo in 1997 but whose roots date back to 1921. The company has operations throughout the United States, Canada, Latin America and Asia. Headquartered in Stamford, Cenveo employs an estimated 8,400 people worldwide. Two business segments are operated by Cenveo: the envelopes, forms and labels segment and the commercial printing segment. The commercial printing segment has 36 manufacturing facilities where annual reports, car brochures, specialty packaging, brand marketing collateral and general commercial printing are printed. So far, we have listed the major companies in Us but if you are interested in more you should get your hands on a US printing companies data base and the right place to find it is : http://printing-companies.org/list-of-usa-printing-companies/. Need a printer? Check out this Heidelberg ! Thank you for sharing us with this valuable information. You have described all the company name with detail information. I would wounder more if you provide their official website (if they has). But still you have done a good job.